An international team, led by researchers from the Department of Astrophysics/AIM Laboratory of CEA-Irfu has just highlighted a new population of very remote galaxies, which had so far escaped the deepest observations of the Universe. During the summer of 2016, at more than 5000 meters of altitude on the Chilean highlands, the antennas of the large interferometer ALMA (Atacama Large Millimeter/submillimeter Array) scrutinized for more than 20 hours one of the best studied regions of the sky. These observations revealed galaxies still unknown, very massive but opaque, emitting only a very small amont of visible light due to a large quantity of dust. These "dark" galaxies, very far away, which could be the progenitors of the most massive galaxies in the universe, reveal that the importance of star formation, during the first billion years of cosmic history, could have been largely underestimated so far. These results have just been published in the journal Astronomy & Astrophysics. Understanding the formation and evolution of galaxies requires extremely deep observations of the Universe, in order to be able to capture light from the very distant galaxies that formed at the beginning of the Universe. As part of a large international consortium, CEA researchers used the ALMA interferometer to observe the center of a region of the sky called "GOODS-South", one of the best explored cosmological fields at present. This region of 70 arcmin2 covers only one-tenth of the Moon's surface, which is about the surface of the sky covered by the mine with a pencil held at arm's length. It has already been observed by many space and terrestrial telescopes, covering a wide range of wavelengths, from X-rays to radio waves, including images obtained by the Hubble, Herschel, Chandra and Spitzer space telescopes. . In total, more than 20,000 galaxies have been identified in this sky test region, making it the most important laboratory for studying the evolution of galaxies. Left: network of the ALMA antennas in Chile. Right: representation of the size of the GOODS-South field, showing the limits of the Chandra deep field (X-ray), the Hubble deep and ultra deep field (HUDF) (visible and infrared) and the ALMA field (millimeter). The area covered by ALMA is 7x10 arc minutes. ALMA, unlike the Hubble telescope, does not directly detect the light emitted by the stars. Observing at millimeter wavelengths, ALMA is sensitive to radiation emitted by interstellar dust grains that absorb radiation from young stars. Thus, massive galaxies containing a large amount of dust can be made opaque by it and become undetectable by telescopes observing in the visible light, while they can emerge in millimeter wavelengths. The strength of ALMA comes from the use of an array of antennas, spaced apart from each other, which allows to obtain high resolution images, even at the large wavelengths of the millimeter domain. Twenty galaxies have been discovered by ALMA in the GOODS-Sud region. These are among the most massive and farthest galaxies in this region of the sky. Four of them, 20% of the sample were not seen by the Hubble telescope: they are "dark" galaxies, seen for the first time. Masses (expressed in solar masses) of all galaxies detected in the GOODS-South region as a function of the redshift, indicating their distance. 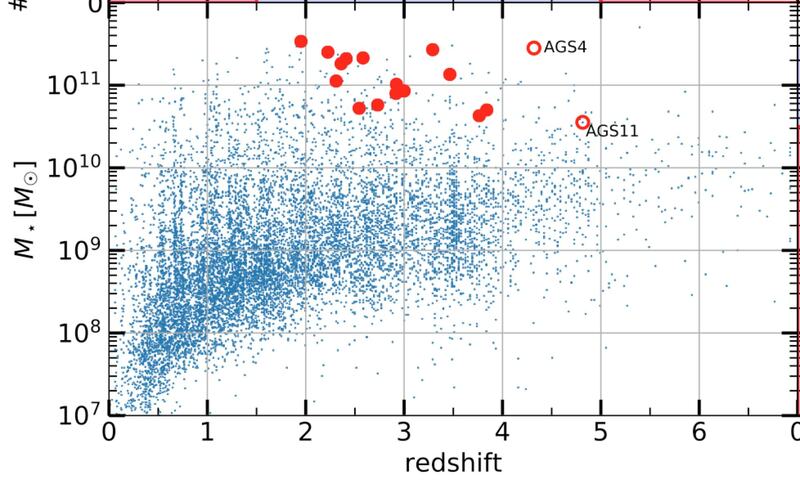 The ALMA detections for which the mass and the redshift have been determined are indicated in red. These are among the most massive. Among these sources, galaxies not detected by the Hubble Space Telescope are indicated with circles. For two of the four galaxies detected by ALMA but not visible by the Hubble telescope, a distance could be estimated. In both cases, these are the farthest galaxies in our sample and we see them as they were more than 12 billion years ago, less than 2 billion years after the Big Bang. To find out more precisely the proportion of these dark galaxies that has so far escaped detection by the Hubble telescope, new observations of deep fields of the sky will be needed. The percentage given by this study (20%) suggests that the number of these galaxies could be much larger than expected in the far universe and the cosmic history of galaxy formation is likely to be profoundly altered. Example of two galaxies discovered by ALMA but invisible for the Hubble telescope. The white outlines represent the millimetric light detected by ALMA, superimposed on a deep image of Hubble. On the left: ALMA millimetric radiation is centered within 0.4 arc of a close galaxy as seen by Hubble, but the ALMA resolution shows that the ALMA flux does not coincide with this galaxy. 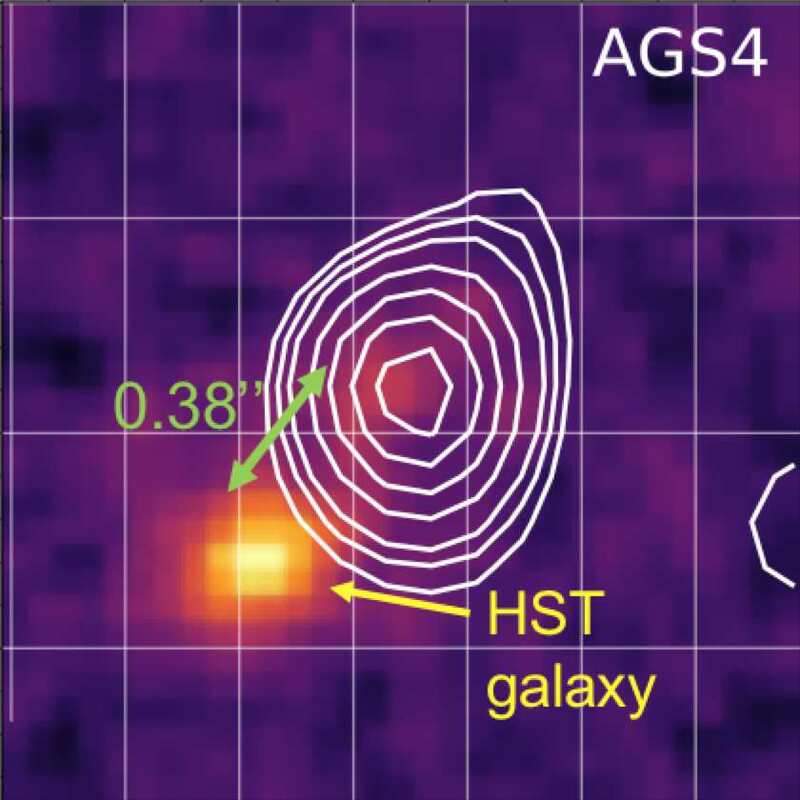 Right: In the image, no visible flux is detected by the Hubble satellite at the position of the ALMA source.